Malta Independent, 30/09/2013: NEW YORK (AP) — Tom Hanks has had enough of playing real people. 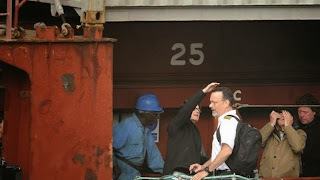 In Paul Greengrass' docudrama "Captain Phillips," which premiered Friday as the opening night film of the New York Film Festival, he plays Richard Phillips, the captain of a cargo ship famously taken by Somali pirates in 2009. Partly filmed in Malta, all marine locations were shot at the Mediterranean Film Studios or in the open sea around the Maltese Islands. Earlier this year, Hanks made his Broadway debut playing New York journalist Mike McAlary in Nora Ephron's "Lucky Guy." And later this year, he stars as Walt Disney in "Saving Mr. Banks," about the making of "Mary Poppins." "I got to get out of this racket," Hanks said sheepishly ahead of the Friday night premiere. "It's killing me. ""Captain Phillips," which is expected to be a major contender in Hollywood's awards season, debuted at the NYFF to enthusiastic reviews and particular acclaim for Hanks' performance.